Here’s my first attempt at watercolor painting. 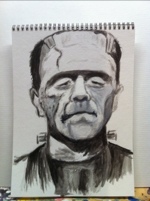 This entry was posted in Drawing, Halloween, horror, painting and tagged Boris Karloff, Frankenstein, Painting. Bookmark the permalink.